26. One of our lamps posts is about to go missing? 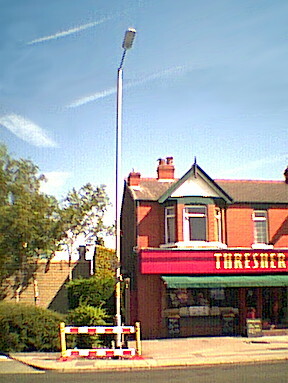 (Left :) The old lamp outside Threshers has a mini-trench around its base and a bit of a barrier to stop the customers falling into the hole. Looks like it's going to be absent some day soon -- although it still bears the Homewatch and No Parking signs and the hydrant information. A couple of days later : the hole was filled in and the lamp stayed put, but disconnected and no longer competing with the white-light replacements. 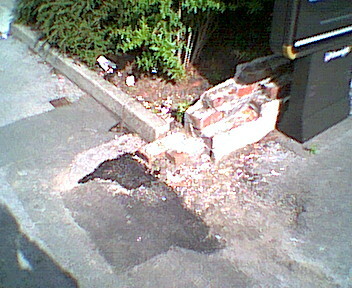 A couple of weeks later : (right:) the old lamp was there on Sunday morning but it had vanished, along with the Home Watch and No Parking signs, and the fairly essential hydrant info, by the morning of Monday, 28th July. The darkest, freshest patch of tarmac at the end of the ruined wall marks the spot where it used to be. A bloke turned up to drill holes in the front wall of Thresher's to re-install the hydrant sign  which disappeared with the above lamp post a mere 3 months ago. No sign of our Triv-Dems doing anything about the Homewatch and No Parking signs, though. 27. 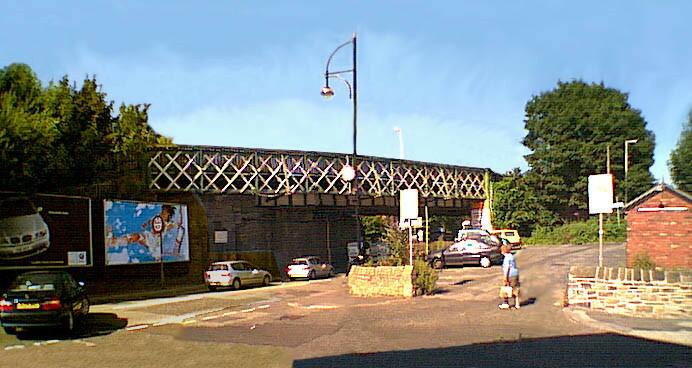 The new lamp at the railway bridge. A view from Guywood lane of the lamp post at the railway station car park.